The Hillco Cob Collection System was designed specifically for John Deere STS combines and utilizes innovative single-pass collection technology that maximizes cob cleaning and collection capabilities with minimal impact on harvesting speed and efficiency. The system also provides the flexibility to use either a combine-pulled cart or a tractor-pulled cart, depending on the farming operation and field conditions. "John Deere has partnered with universities and technology companies to develop and field test a number of potential systems for the collection and transportation of different types of cellulosic materials," says Scott Jensen, segment manager for John Deere. "For producers, key requirements include; utilizing existing equipment where possible, minimizing impact on normal harvesting operations, and leveraging advanced technology where appropriate in the development of cost-efficient and agronomically sustainable solutions for on-farm biomass collection." The Hillco system gives corn growers excellent flexibility and efficiency in a cob and biomass harvesting system, notes Jensen. "It features push-button control for turning on and off the collection of the cobs; allows for quick, easy changeover between crops; features variable cleaning technology; and uses a rugged, easy-to-dump collection cart that can be towed by the combine or tractor." "Hillco Technologies enjoys a great working relationship with John Deere as we develop new collection technologies for the biomass industry," says Lenny Hill, president of Hillco Technologies. "Our previous experience integrating leveling systems into combines gives us the knowledge and expertise needed to blend these new collection technologies with John Deere's STS combines to create a true, dual-use grain and biomass harvesting system." 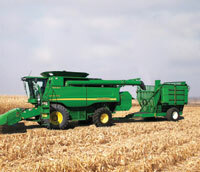 The Hillco Cob Collection System is approved by John Deere for use with 9670, 9770 and 9870 model STS Combines. All original combine warranties remain in full effect after the installation of the system. There is limited availability of the units for the 2010 harvest season.